The FAA released Southern California’s Draft Environmental Assessment(EA) which redesigns the airspace from Santa Barbara to San Diego, from Los Angeles to Palm Springs. The SoCal “Optimization of Airspace Procedures in the Metroplex” (OAPM) project will replace dozens of existing conventional air traffic patterns with new, more precise Nextgen satellite-based procedures. Sounds great, or is it? The FAA’s EA document is extremely technical and very simplistic- and not always in the right places. The purpose of this blog is to explore issues with the draft EA as a document, and as a study, in hopes that the issues of both be addressed. My focus is on LAX impacts including Culver City and many critiques are applicable many places. The draft EA is under public comment until midnight- October 8th, 2015, you are free to use any of my study points to spur your own comments. The FAA issued a Finding of No Significant Impact and Record of Decision (FONSI/ROD) for the So Cal Metroplex Project. They will not proceed to an EIS. They plan to immediately implement the SoCal Metroplex NextGen project starting in November and continuing though April 2017. Communities, Cities and individuals have 60 days to apply for review of the decision by filing a petition for review in the appropriate U.S. Court of Appeals no later than 60 days after 8/31/2016 in accordance with the provisions of 49 U.S.C. § 46110. The CLIFY dance continues. CLIFY is the new waypoint which replaces the SMO waypoint. This waypoint controls an Aircraft’s coastal point of entry and the overflight neighborhoods of planes using LAX’s North Arrival routes. The FAA had published multiple locations for CLIFY during the comment period. 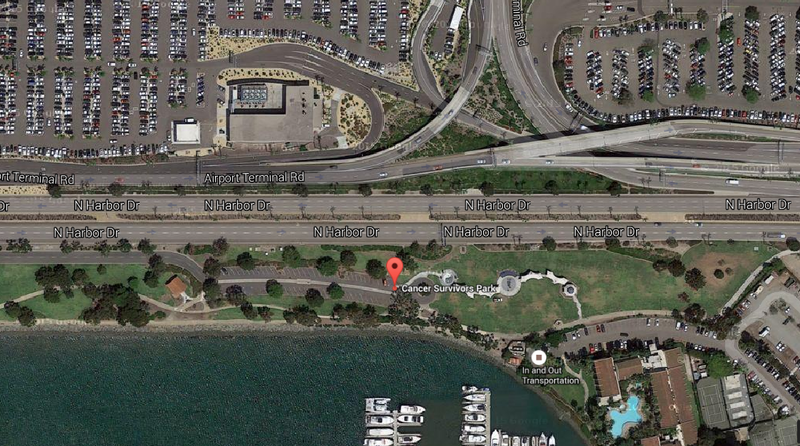 It varied from a point close to the existing SMO to over a tree in Santa Monica’s Clover Park. The last official place the FAA put it was in Clover Park. It’s back near SMO now- 120 feet west of the current SMO waypoint. Those close to SMO may experience slight overflight change. Due to the previously proposed waypoint DAHJR, planes will fly slightly farther north than existing paths for all others on the path. In Culver City the current flight paths fly over Carlson Park and intersect Duquesne at Jefferson. With the CLIFY change, flights will intersect Duquesne farther north over the Police Station. MDNYT STAR- Over Ocean Procedure. The Draft EA effectively removed part of the noise abatement efforts of the North Arrival nighttime Over Ocean Procedure by lowering planes to 7000 ft at Santa Monica Airport. Public comment on this has most likely led the FAA to reconsider. The Final EA has restored the previous procedure with a new one called MDNYT STAR. The Final EA maintains the 8000 ft minimum altitude over Santa Monica Airport but promises that flights can fly up to 2000 ft higher over Santa Monica Airport while in Over Ocean Operations. The MDNYT STAR is to follow the existing path used by the current Over Ocean REDEYE path. This has been confirmed with the released TARGET data. The Draft EA proposal for the BIGBR STAR to replace the East Flow Route BASSET still stands. During Daytime east flow operations (mostly due to Santa Ana winds) Aircraft will cross Santa Monica Airport at the lower 7000 ft. They will also be flying a more northern route that crosses West LA college and the High School. Below are excerpts and comments on the North Arrival issues. The new arrival paths and CLIFY are much like my original post last year on the Culver City Flight Paths. The post and the google maps have been updated to show the FINAL EA positions. Below are the center-lines of the (3) new arrival paths (thicker lines) and (2) old arrival paths in a zoomable map [expand link here: http://bit.ly/1PyROi2]. Note that the MDNYT STAR overlies the REDEYE Over Ocean path. The Actual flight path widths vary between a 1 nautical mile wide radius for the conventional and RNAV procedures, to 1/3 of a mile radius for newer RNP procedures -which happens east of Culver City after DAHJR. Roughly 36% of the traffic is estimated to follow a precise line. There is no change to LAX departure paths over/near Culver City from the SoCal Nextgen Project. Several commenters expressed concern that the Proposed Action procedures would lower or shift aircraft flight paths over the cities of Los Angeles, Culver City, Santa Monica, and other surrounding communities. Primarily, the concern was for LAX north arrivals when LAX is in west flow operations, which is the main direction for LAX arrivals. Most concerns were focused on procedure designs and waypoint information provided by the FAA during the Draft EA public comment period. DAHJR, at an altitude restriction of 6,000 feet MSL, which would be slightly higher in altitude compared to current procedures. In a prompt response the LA Weekly made the connection between the 147,422 complaints from the NorCal NextGen implementation and our proposed SoCal implementation. IS MASSIVE JETLINER NOISE COMING TO UNSUSPECTING L.A.? Reporter Darralynn Hutson @darralynnhutson delivers a strong article with choice quotes from community members June Lehrman, Ken Palmer, Denny Schneider, Marty Rubin and “technical blogger Stephen Murray.” LA Weekly managing editor Jill Stewart @jillstewart also took effort sifting through research data and further shaping the article despite being on vacation. People are scared after the 2700% jump in Bay Area noise complaints where the FAA said “no impact” in its NextGen EA- Same as they said for LA’s. Unfortunately the video horribly mashes up the Existing Santa Monica Airport Jet issue with NextGen- but that was created separate from the article. Doors to Arrival maps are featured throughout. They sifted through my CartodB maps and found my “Negative change in noise map.” I don’t mention this elsewhere but its a map that shows all the places where an increase in noise occurs due to NextGen. “The FAA is of two parts: One part creates flight path procedures and the other does Air Traffic Control(ATC). Flight path changes are public documents released for pilots and airports to follow- they are very visible and every year they are republished. There have been changes. At LAX, Culver City had a change to its feeding arrival route (called SADDE) via a RNAV implementation in 2012, and the northbound departures (called LOOP) in 2014. Both of these procedural changes happened during the Nextgen design period, the FAA NextGen project team cites them and used these new procedures to base their noise analysis on instead of the “pre NextGen” procedures. So, technically, NextGen isn’t implemented but some paths have been pre-upgraded during the NextGen process. These are the only recent changes. ATC instructions, on the other hand, are like a black box that only pilots hear- there is no paper trail that explains why a plane was routed the way it was even if it was counter to a published procedure. A suspicion is that a combination of flight path changes and ATC instructions are dropping planes lower and slowly “boiling the frog” with progressive increases in noise. By request I created this map of existing (pre-NextGen) noise impacts from aircraft in the SoCal study area. Uses are to compare what you’re hearing against the FAA’s modeled baseline. Disclaimer: This map only contains those flight paths and operations that are related to the SoCal NextGen project at major Class B & C Airspace airports plus Santa Monica. Flights between local airports, and to/from the smaller airports, those that travel in Class D and E Airspace are not in the scope of the FAA’s noise analysis. No helicopters or banner towing biplanes are in this analysis. Source is FAA SoCal EA’s Google Earth supplemental data and US Census Department 2010 population data. In a seeming battle between PR and and its own research, the FAA doesn’t agree on what the fuel use and emissions are for the SoCal Metroplex project. The PR department claims that the proposed NextGen changes will result in less fuel and less emissions, the scientists pronounce more and more. These are annual benefits expected to accrue upon completion of the NextGen near-term procedural improvements implemented by the FAA’s Metroplex program. They are based on the FAA’s preliminary assessment of proposed airspace improvements compared to operations in a year before any improvements were made. The value of the projected fuel savings is based on a $2.85 per gallon rate. The data estimates are current as of July 2015. Why the discrepancy? Is it possible that the PR department has better data that the actual researchers? The Website claims the data is accurate from July 2015 yet the EA was released in June of 2015. Did something happen in the intervening month that changed the results of the EA? If so, why was the EA not adjusted with this new data? I lean towards believing the Draft EA is quoting the more correct numbers but then I also believe that facts should have a data-based bias. FAA, please correct this misleading discrepancy, and issue a press release so the public can know which set of numbers to believe. Edit 12/8/15: In an article by “Aviation Today” dated 6/23/15, after the FAA’s release of the Draft EA, the reporter states “..the agency is still calculating the projected fuel savings and emissions data for the Southern California program.” No response yet from FAA on the real set of numbers. I sent off an appreciative letter to the enterprising LA Times reporter @TheCityMaven, favorited her tweet and followed her feed. Then I sent off this quick letter to the editor. Over 1.1 million people will be impacted by an increase in aircraft noise due to the rollout of the FAA’s SoCal NextGen proposal. In Sunday’s “Culver City residents say noise from LAX flights is on the Rise” you’ve succinctly summarized the 2012 change in aircraft flights over Culver City but have missed the bigger picture issue which the #NoFlyDay rally was organized to expose. Almost all communities between Santa Barbara, San Diego and Palm Springs will be impacted by proposed NextGen changes. Many communities are going to be hit much harder than Culver City. Culver City is just one community that took part in Sunday’s nationwide protest against NextGen. There will be increase of fuel use by 8 metric tons (MT), and increase of CO2 emissions by 27 MT in the first year alone. 8.6 million people will experience an increase of aircraft noise. In Culver City the late-night flight path will be lowered 1000 ft. The FAA’s day-long metric averages thousands of ambient aircraft noise sources- but fails to represent how the noise from those individual planes, flying lower over our homes, late at night, will be louder. Despite what this number may be in modeling, people on the ground know that lower equals louder. The FAA may be just following procedures but that doesn’t mean those procedures are “just” or correct. NextGen, as implemented by the FAA, carries disproportionate burdens to people on the ground. Thank you LA Times for exploring this topic. This omission of NextGen is understandable. Having been talking to people and briefing elected officials on the nuances I understand how this can move into potentially messy details. The FAA doesn’t make it any easier to understand or communicate about this difficult subject. There have been very few reporters who have ventured into the depths. I look forward to the LA Times carrying this forward in greater depth to the 19 million people affected by the SoCal NextGen changes. On Saturday October 24th, communities across the US will stand up to protest the FAA’s implementation of NextGen. Within the Socal Metroplex Culver City and San Diego will hold rallys. It’s just past midnight. on 10/8/20115, at 11:59pm I submitted my last comment to the FAA about the SoCal NextGen Project. There has been no announcement of an additional extension for the comment period. After 4 months of feedback it look like the deadline will stick- its time to take a break. The comment period for the Draft Environmental Assessment(EA) for the FAA’s SoCal NextGen project had been extended twice already. When The FAA released the draft EA in June, they declared “No Significant Impacts” and was poised to carry out their changes to the airspace. I believe enough evidence has been delivered to the FAA about specific shortcomings of their EA that they need to pause and take, in what is called legal language, a “hard look” at their SoCal implementation of NextGen. The Sierra Club Angeles chapter was very generous, enthusiastic and patient when I proposed the project to provide specific comments in line with the Sierra Club’s concerns. I’m glad that the Club was able to voice comments on this important issue. I recommend reading the Document- It’s 21 pages- half of them are tables and pictures so it’s not a tough read. To summarize though I’ll share some highlights of the Sierra Club comments to the FAA Socal Metroplex below. Public involvement means more than sending a press release to the major newspapers inviting people to read your 800 page document. The 11 public meetings introduced was heartening but still falls short when it comes to communication. When people come to a document, or a meeting – they want to know whats the big picture, what things will change for me, what are my options? People hear aircraft noise one – plane – at – a – time and need to be given feedback in a way that hooks into this comprehension. Instead, the EA describes noise as an average of noise events over the day. An average describes the measure but fails to communicate the quality of the noise. Using a supplemental metric, such as number of times a plane over 60dB will fly over – a conversation pausing noise level – can help bridge this need for understanding. Here is the Sierra Club’s map of 400 natural resource sites and areas that will be affected by increased noise from the Proposed Action. Special status is given by the FAA to sites and resources within the DOT’s Section 4(f) list. These are publicly owned public parks, recreation areas, or wildlife or waterfowl refuge sites. The SC argument is derived from the one I explored in my EA fails on Federally identified Noise Sensitive areas comments. These 4(f) sites and cultural resources are not constrained by the noise criteria and, according to FAA regulations and legal precedent, they are eligible for special consideration which includes cumulative effects- the incremental increase of aircraft noise over time. A claim of “No Significant Impact” can not be made until it is proven across these sites. I believe this argument on 4(f) sites is so important that it’s reiterated separate from just the noise impacts. The Sierra Club asks that diligence be pursued in the evaluation of any potential impacts to endangered, threatened and sensitive wildlife species found at all 213 ecological or wilderness reserves, wildlife refuges, sanctuary’s, preserves and study areas affected in the Metroplex. A few days ago I did a search on “comments to FAA Environmental Assessment” and got distressingly few results. In a region of 19,249,073 people there were three communities: Culver City, Newport Beach and Point Loma- which are the hot spots for comments. Residents may disagree about this but these 3 communities are not the worst off. Yesterday I called the City of Orange, perhaps one of the hardest hit communities close to me, and reminded the assistant City Manager of the FAA’s deadline. Seems the FAA doesn’t reach out to the communities most strongly affected. All government agencies are COMPELLED by Executive Order to take the steps to make sure that high and adverse impacts don’t affect low-income and minority populations disproportionately. Here is a sample across the Metroplex that shows someone was flying on autopilot when they summarily dismissed the need to study these high or severe impacts. *The FAA’s criteria for low income in the SoCal Metroplex area is 11.7% and 40.5% for minorities. If that doesn’t make you cry, you’re not a bleeding-heart liberal. There are some affluent white people too that will be surprised by a 6dB DNL increase of aircraft noise day-one of implementation. Since the wealthy don’t live packed as close together, with a narrow flight path, the disadvantage remains with those already disadvantaged. Though not included with the Sierra Club comments, an interactive map of noise impacts used to help research is here. One of the more disappointing pieces of information is that the Proposed changes will not result in saved fuel or reduced emissions. It will cause 8.2 metric tons (MT) of added fuel to be burned this coming year resulting in 27 MT of additional CO2 and other non specified pollutants – including particulate matter (PM10 & PM2.5). If the efficiency of the routes do not increase, what is the purpose of creating more ground impacts through razor-precise flight paths that concentrate noise, shortening of approach and descent paths (with resultant altitude drops over residences), and the unilateral discarding of established community noise abatement procedures? NextGen did not deliver on its promise. There are good things about satellite navigation and it should be more widespread. Unfortunately NextGen, as implemented by the FAA, carries disproportionate burdens to people on the ground. Other problems are a result of the FAA not taking their full responsibility to protect the people on the ground. I sincerely hope the FAA will take a harder look at their proposal, adjust it accordingly, and embark upon a mature, and understandable, Environmental Impact Statement. At that time I, along with the Sierra Club project team, will be happy to supply further positive comment. Over the City of Culver City, the levels of impacts stated by the OAPM EA to support their finding of No Significant Impact are based on comparing the proposed new flight paths to a “no action” alternative. The “no action alternative” is based on current flight patterns — assessed as of December 2012, and projected into 2015 and 2020. Thus, the current and former flight patterns constitute a baseline against which future proposed levels are compared. The baseline is, however, inaccurate. The true baseline should be 6 months before in June 2012 prior to a flight path change implemented without public notice and comment. The EA’s December 2012, 2015 and 2020 baselines therefore skew the before-and-after analysis by choosing a “before” level that already reflects the pre-accomplished lowering of altitudes over a recently peaceful and jet-fuel-emissions-free residential environment. There was a slight lowering of aircraft altitudes in 2012 after the implementation of the SADDE RNAV/LAX KEACH STAR overlay which ends at SMO. The EA needs to include the cumulative impact of the LAX KEACH STAR overlay of the western part of the SADDE STAR, which was implemented while the SoCal OPAM project was under way. In the OAPM study team analysis of the CRSHR STAR, they stated ” The OST identified no gain in efficiency between the KEACH and the SADDE and expects no change in operations due to its implementation.” If they were effectively equivalent, as this presumption states, the baseline evaluation needs to exclude the KEACH from noise analysis and use the earlier SADDE conventional as baseline. Here is a collection of comments submitted to the FAA and made public on the Socal Metroplex documents. After the public comment period closes the FAA may respond as soon as 30 days. The response may be a Findings of No Significant Impacts(FONSI) with or without specific corrections and mitigation, or it could result in a supplemental or revised EA, or go ahead to a more detailed Environmental Impact Statement. It’s not likely that the FAA will close up shop and move on. I’ll add whatever links others forward. The Change in Noise map I created shows the intensity of noise changes. This is just a quick post to show how the map can be used to inform what you’re seeing in the Google Earth data. I ran across some EA comments by Tabor Law for their clients AirFair out of Newport Beach. In it they question the dispersion of traffic entering and exiting John Wayne Airport. The flight tracks in the Google Earth data are densely stacked upon each other so it’s difficult to tell where the new RNAV concentration is- if there is one. In addition the Google Earth data is missing altitude information. A comparison of these 3 maps ( Google Earth Current, Google Earth Proposed, and the DTA Change in Noise) shows the clear concentration of noise over the City of Orange, the Balboa Island and Peninsula and, surprisingly, a well of relative relief over Santa Ana. The majority non-white population in Orange’s Old Town is 17160 people. One of the 3 affected census tracts has 24% population at the 100% poverty level and 43% at the 200% poverty level. Whether flights will fly these paths in the same proportion as the noise modelers have specified is open to conjecture- but this helps demonstrate what they were thinking and ties it to real world impacts.